How To Get Paid STEAM Games For FREE (Blog Post #2) - KABALYERO - PLAY, BLOG & EARN! How to get paid STEAM Games for FREE? Do you want to know another way? If you do then read this blog post but if you don't then what are you doing here? 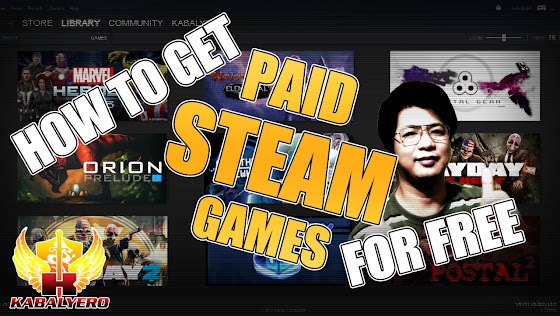 In my last How to get paid STEAM Games for FREE video, I shared to you one method of getting paid Steam games for free. In this video, I'm going to share to you another method and this method is very easy, simple to do and it's 100 percent legal. Guys, I'm talking about joining Game Giveaways. Seriously, joining Game Giveaways is a very easy, simple to do and 100 percent legal way of getting paid Steam games for free. In fact, I've gotten a few paid Steam games like 7th Legion, Forced, Vox and even Epigenesis legally for free by simply joining Game Giveaways. Now, these Game Giveaways are everywhere. They are posted in Reddit, in Google Plus Communties, in YouTube by your favorite YouTuber, in various gaming forums and communities like Cimmarian, in Twitter, in Facebook and many more. You will even find Game Giveaways in my YouTube channel or in this blog and I've given away a few paid Steam games already as well.